As we worked towards finalising this issue, we were able to break away and take part in a local, two-day event – Subsea Valley. With a focus on the subsea industry that’s located in or not so far from the Oslo region of Norway, the event focuses on some of the industry’s exciting technologies. As we continue to experience has been hailed as one of the worst downturns ever, Subsea Valley was surprisingly upbeat – a trend that we see from many of this issue’s contributors. This issue kicks-off with Aquatic, Aquatic Engineering & Construction Ltd, an Acteon company, which looks at how the company is fairing in the North Sea. Weathering the downturn has meant reviewing business practices and market assumptions, which lead to focusing on Aquatic’s understanding what drives their customers’ requirements. 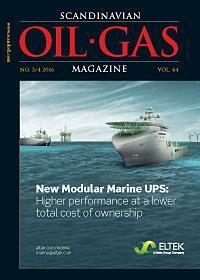 Another perspective on operating in today’s North Sea oil and gas industry is provided by TNW Group. For them, innovation is key, and one example is their StimLite service, providing well intervention and stimulation. Douglas-Westwood explains how sustained low oil prices have raised concerns over the viability of many deepwater developments. Citing the “rethink” that has resulted in a move towards standardisation and the streamlining of development processes, they forecast an upswing before this decade is out. Keeping costs down is on everyone’s mind, and Eltek tells us about their modular marine AC UPS, which not only ensures that critical applications on-board ships and offshore installations are continuously powered, but, when considered from its lifetime costs, leads to a significantly reduced total cost of ownership. Trelleborg provides us with look into its “Next Level” report, in which a panel of experts share their insights into how the downturn is a good opportunity for executives to exercise their creativity. One cost-saving technology has been ever-steady march towards digitalisation. From Honeywell, we hear that a typical oil platform now produces approximately one terabyte of data every day – and about how utilisation of the digital oilfield can harness that data with a range of “digital suites”. SPE Intelligent Energy 2016 will showcase the latest trends and opportunities in big data, cloud computing and intelligent systems, and from the event’s Programme Conference Chair, we hear how digitalisation is a relatively new way of working that has the potential to strip out complexities and streamline processes and procedures, ultimately cutting costs, improving production efficiency and reducing risk. And with exciting technologies in mind, we also have a look at the upcoming annual Offshore Technology Conference in Houston, Texas. Be sure to be ready for 4 packed days of presentations and panel discussion in the technical sessions, as well as topical luncheons, networking receptions, and touring amongst the 2,400 exhibitors. Although the industry is experiencing lean times, many are doing their best to prepare for the upswing – which is not a matter of if, but of when. And when it arrives, the industry – from what we see at events like Subsea Valley and OTC – will be ready to take advantage of the opportunity. Let us know what you’re doing to make the best of these times – we can help you tell the industry how you’re taking this opportunity to prepare for the future.